Posted on April 2, 2017 March 28, 2017 by SherylPosted in FoodTagged meat, pork, recipe. LOL . . . I could have worded it better. I guess it’s “aged” meat. My printer sure gets a workout with your recipes! You can’t deny that these have been tried and true for 100 years!! I’ll have to wait till my next shopping day to do this one though. Some foods have stood the test of time. It’s wonderful it hear that I’m selecting recipes that you think are worthy of printing. Well, despite their hard times, they survived and thrived….they must’ve been doing something right!! I know they liked to eat well – glutens, cholesterol and calories included!! I agree! I like how you put it – “They survived and thrived.” That says a lot. I have vague memories rising of a recipe I used to make that involved pork chops, mayo (?) and sliced onion atop the chops. I remember liking them. I’ll see if I can conjure up that one, and if I find it’s another oldie but goodie, I’ll pass it on. Now you’ve made me curious about whether the recipe you’re thinking of included mayo. I never would have thought of using it with pork chops, but I can see that it might make them moister. I’m keeping my fingers crossed that you are able to “conjure” it up. I’m going to do this! It sounds delicious, and the air is still cool enough that we’ll enjoy having the oven on. 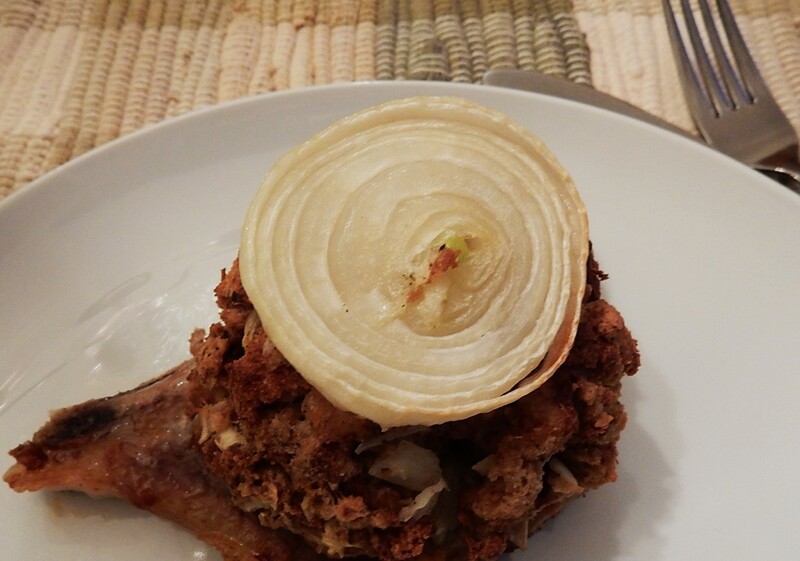 I didn’t find it too “oniony.” Actually when I began to eat the pork chop, I couldn’t quite figure out how cut the onion into bit-sized pieces when perched on top of the dressing – so I pushed it aside and ate it separately. I’m intrigued by the chicken recipe you described. I’ve also made some old recipes that needed more tweaking (or that I just totally gave up on). These sound delicious! I have always hated pork chops since Mom overcooked to prevent trichanosis…sp? Looks like a clever way to avoid drying the chops when baking. The pork chops turned out nicely. It was yummy. I really liked the way the dressing was seasoned. Sounds like food from my childhood. Must be getting old. 🙂 I keep telling myself that I’m as young as I feel. I don’t think I have ever squeezed bread crumbs.. New idea .. might just have to try that. It worked really well to shape the bread crumbs into balls. Sounds not only good but fun to make. What a fun memory! I’d love to know all the ways you served hot dogs. I can only think of a few. When my children were at home, I occasionally made “pigs in a blanket,” but that’s as adventuresome as I got. The recipes were very simple. ‘Curlies’ were hot dogs in very thin lengthways slices fried until they curled. We had hot dog pizza made with the Kraft pizza crust, hotdogs stuffed with cheese and rolled in dough, done in the oven. I chopped hot dogs in chunks and did stir-fries (oh yuck) with garden vegetables; I also spiral cut hot dogs and stuffed the cut edge with bacon and put them in the oven. Simple days. Oddly, I don’t ever remember having hot dogs in a bun! It’s a wonder my siblings aren’t dead of cholesterol. I love it. You were such a creative cook. The hot dogs stuffed with bacon sounds very modern–and similar to some recipes that I have vague memories of seeing on other websites. Definitely trying this! I’ve been looking for a pork chop recipe to serve to my 13-year old grandson. He’s an eating machine and likes a home cooked meal when he comes over. I know this will be a hit! 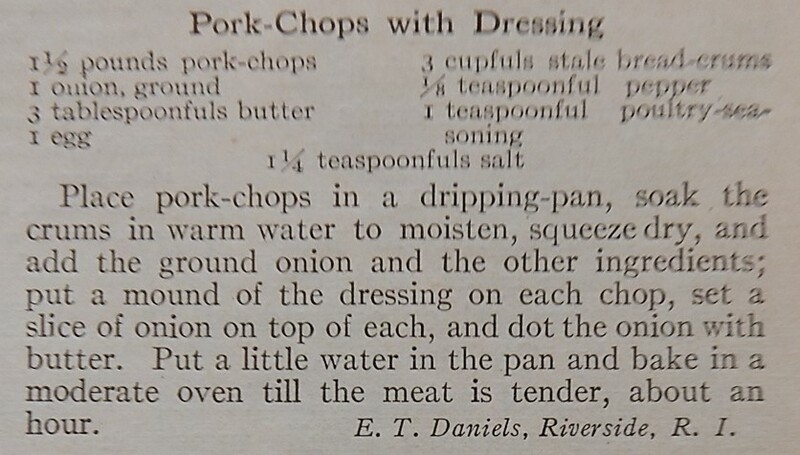 If he likes pork chops, I think that he’d enjoy this recipe. We tried them and he loved them! Very tasty and easy to prepare – thank you! May I share the link on my blog? If you don’t like stuffing, I’d probably pass on this recipe. In my opinion the stuffing was the best part of the recipe. I stopped by your blog, and enjoyed reading about Family Search Recipes. It sounds like it provides a very useful way of preserving family recipes. I firmly believe that dressing (or stuffing if you call it that) makes everything better! I agree. 🙂 I generally call it “stuffing”, but since the old recipe called it “dressing”, I decided to use that term for this post. I agree- potlucks are wonderful. People often take foods made using their best recipes to potlucks.